That's all from Holyrood Live on Thursday 21 February 2019. MSPs vote to approve the Scottish government's Budget (Scotland) (No.3) Bill. 66 MSPs backed it and 58 voted against. The SNP government struck a deal with the Scottish Greens last month to ensure the budget passed. 66 MSPs back it and 58 vote against. Finance Secretary Derek Mackay says MSPs are being asked to vote on the £42.5bn budget tonight. Mr Mackay points out Brexit was not even mentioned by the Tories in this debate. He points to the chief economist's report which says if there is a no deal Brexit there will be a recession with 100,000 people unemployed. Mr Mackay says: "What a disgrace the Tory party has become." The finance secretary goes on to argue the budget increases investment in health and social care integration, the NHS and and in local government. The Tories want to raise less and spend more, he argues. Mr Mackay insists the Labour party brought no credible budget proposals to his office. He concludes calling on MSPs to back the budget now. Tory MSP Adam Tomkins says Scotland needs a budget for business, one that boosts the economy. What we are getting is the very opposite of what Scotland needs, he says. Everyone in Scotland who earns more than £27,000 will pay more tax than their counterparts in England, Mr Tomkins says. He argues this means higher taxes for teachers and firefighters. The SNP don't care about growing the economy the Tory MSP states, insisting they are more focused on pandering to "hard left politics". "Appeasing the Greens is more important to them than sound public policy." He says councils only have the option to put taxes up, not lower them - "that isn't localism" he insists. "Our communities deserve better than this budget," begins Labour MSP Monica Lennon. Ms Lennon argues the budget is a total disappointment. The Labour MSP says when her party asked for a £5 increase in child benefit Derek Mackay said no. Councils have faced devastating cuts of £1.5bn since 2011, says the Labour MSP. She insists chronic underfunding of the NHS has pushed health boards into crisis. Green MSP Andy Wightman begins: "Greens are pleased by what we have achieved in this budget." We are beginning the process of strengthening the role of councils, he says. There has been no shortage of outrage and opposition throughout this year's budget, accompanied by a distinct lack of negotiation he says. Mr Wightman suggests the finance secretary convene a roundtable discussion with all parties in advance of the budget for the next year. SNP MSP Emma Harper argues that nurses on a band 5 salary will have their salary protected. Ms Harper also argues the Scottish government has ensured Scotland remains an attractive place to do business. She says it would be remiss not to mention the uncertainty this "bourach of a Brexit" is causing business and the economy. Independent MSP Mark McDonald confirms that he will be backing the budget, though he accepts the "mathematic irrelevance" of his decision. He calls for thought to be given as to how to make budget planning better, suggesting that involving community planner partnerships come improve localism. SNP MSP John Mason says : "I have to say I think it is a very reasonable budget given the circumstances." With the uncertainty of Brexit, we have to do the best we can, he argues. Tory MSP Liz Smith expresses concern about the transparency of the Scottish government throughout the budget process. She says Mr Mackay has an additional £950m from the Scottish block grant this year. Last year saw radical change in the Scottish budget with very low growth. This year, the growth has picked up, and there's little change. Complaints that austerity is still a drag on Scottish public services don't seem to square with real terms increases on budget heads. The most obvious focus for Derek Mackay wishing to win friends were those in business, though in general, it still doesn't like higher income tax on higher earners. This time last year, Derek Mackay was being the radical. The SNP's finance secretary tore up the income tax system to create a new one for Scotland, and set course for divergence from the Westminster line by dipping into higher earners' pockets. At the same time, the Scottish Fiscal Commission delivered its first forecast for the Scottish economy, with an extremely gloomy 0.7% annual growth rate. That forecast matters because it's the one Derek Mackay has to use for his budgeting. This year, the most notable tax measure was NOT to do something - not to change the threshold for paying the higher rate, sticking with those on at least £43,430. This time, it's Phillip Hammond at Westminster who is being the fiscal radical - tearing up the Treasury orthodoxy of deficit reduction since 2010, and splurging extra cash on the health service. SNP MSP Stuart McMillan surprises no-one by telling the chamber he will be voting for this budget today. Mr McMillan argues 55% of taxpayers will pay less than the rest of the UK. He argues Derek Mackay is doing an excellent job as finance secretary and argues opposition parties should be thanking him. The Scottish government's budget passed a key Holyrood vote last month, after the SNP struck a deal with the Greens. Finance Secretary Derek Mackay said he was "pleased to have reached an agreement" minutes before the Holyrood budget debate was due to begin. The deal includes more core funding for councils and extra powers for them to levy local parking and tourist taxes. Patrick Harvie said the Greens had been "firm but constructive"Image caption: Patrick Harvie said the Greens had been "firm but constructive"
Green co-convener Patrick Harvie said the deal was the result of "constructive politics". He said his party had worked for months to secure extra protection for local services and movement towards reform of local taxation. The deal will see the Greens support the government throughout all three stages of the budget process. How does tax in Scotland compare to the rest of the UK? Labour MSP Colin Smyth says this budget will be remembered as a "shameful attack" on councils. Anyone who denies these cuts are being made is not being honest with Scotland, he insists. SNP MSP Kenneth Gibson highlights cuts to English councils and accuses the Tories of bleating about alleged cuts in Scotland. "The hypocrisy is simply breathtaking", he argues. Labour MSP Johann Lamont asks if the job losses and public service cuts across Scotland are all alleged. Mr Gibson replies Labour's absence of memory on this is unbelievable and argues local government funding is being increased in Scotland. 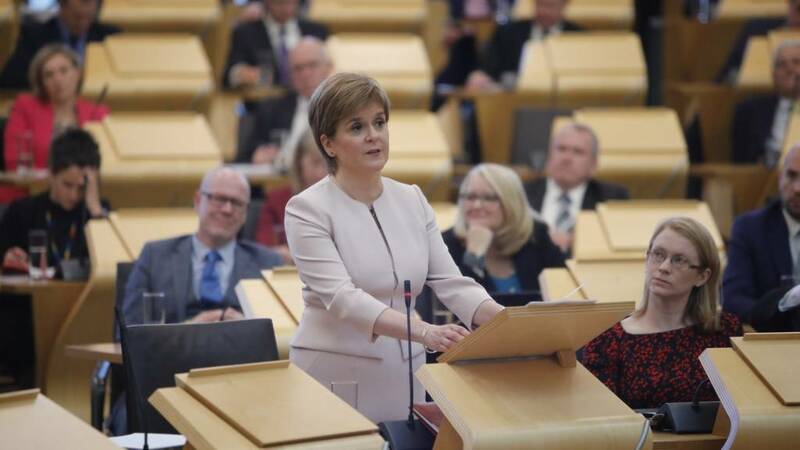 The Scottish government's budget plans for the coming year are to be formally approved by the Scottish Parliament. As part of the agreement, councils could be given new powers to introduce taxes on workplace car parking spaces and tourism - with the government also agreeing to increase core local government funding by £90m and to hold cross-party talks on replacing the council tax. Will Scotland introduce a 'latte levy'? Tory MSP Miles Briggs says many of his constituents in West, East and Midlothian travel into Edinburgh for work. Scottish Green co-convener Patrick Harvie says this causes traffic to flood into the city every day, pointing to the climate change impact this has. Mr Briggs says Edinburgh is the only part of the Scottish economy still growing and the Scottish government is taking this for granted. He says of this year's deal: "We have seen that in this year's SNP-Green budget the lentils have fermented, the sandals have snapped and the watermelon in it is truly rotten."